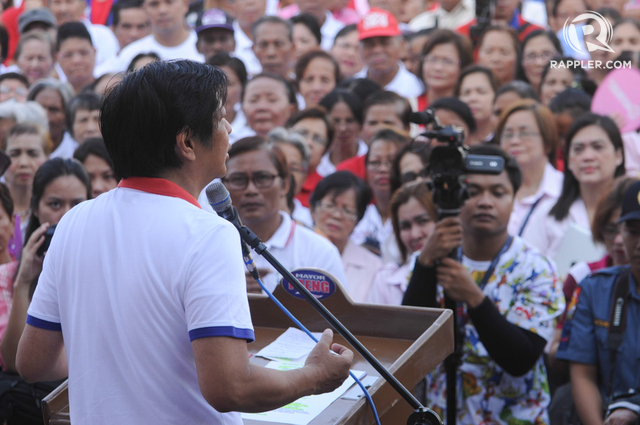 →Who is voting for Bongbong Marcos? Who is voting for Bongbong Marcos? MANILA, Philippines – Analysts and critics say that “millennials,” who comprise nearly 40% of voters, would make Senator Ferdinand “Bongbong” Marcos Jr win the vice presidential race. Millennials, according to the United States-based Pew Research Center, are those born between 1981 and 1996. In the Philippines, these are the people who were born between the period when martial law was lifted and a decade after the EDSA People Power Revolution. Since these voters do not have a first-hand experience of the dark days of the martial rule of the senator’s father, the late President Ferdinand Marcos, they do not have strong aversion to picking Marcos Jr as their bet. Add that to the fact that the Marcos is in a tandem with Senator Miriam Defensor Santiago who, as she claims, is the youth favorite. 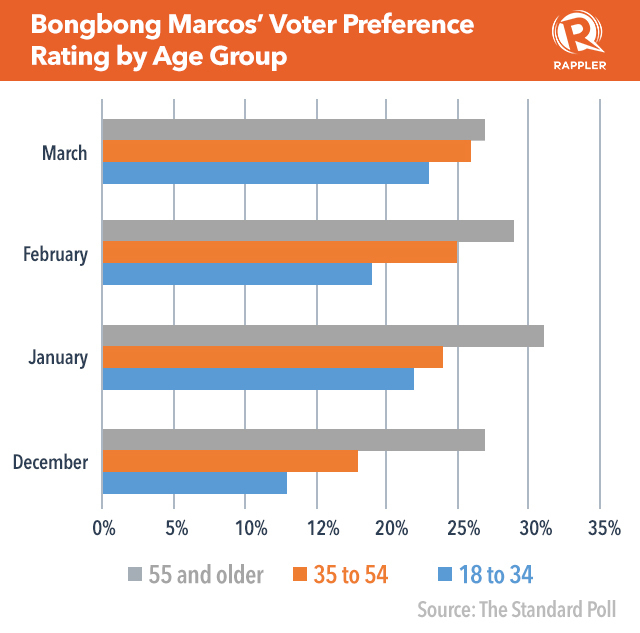 But survey results show that young voters – usually chided for being politically naïve – are not the ones supporting Marcos . 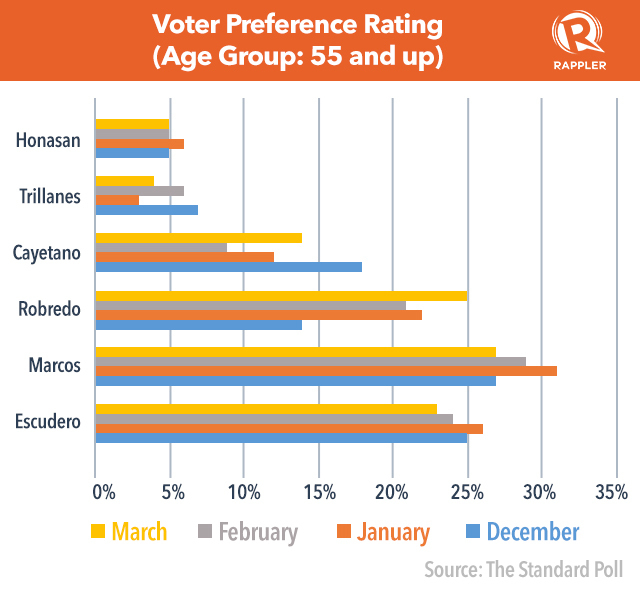 In The Standard’s poll, the leading vice presidential candidate has consistently gotten lower voter preference ratings among those aged 18 to 34 compared to other age groups. It is Senator Francis “Chiz” Escudero who is actually winning the youth – a good distance away from his closest rivals, Marcos and Liberal Party bet Leni Robredo. 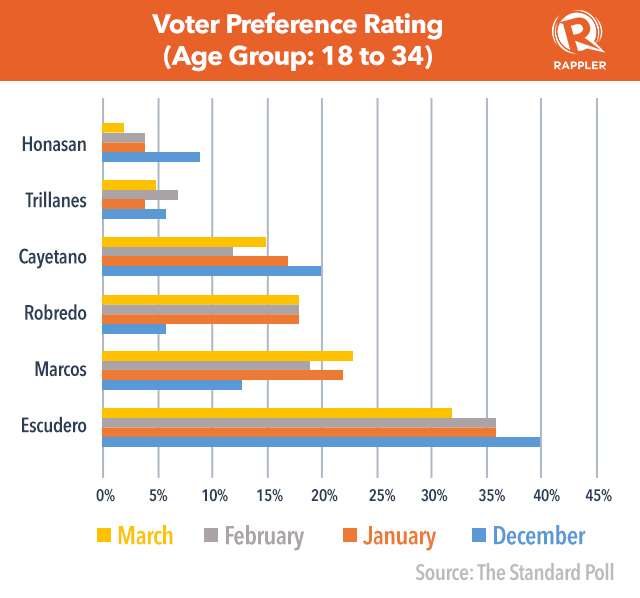 Escudero’s standard-bearer, Senator Grace Poe, is also the top choice of this age bracket. Marcos, on the other hand, is most preferred by voters 55 years old and above – the age group who directly experienced his father’s regime. This data reflects what happens on ground when he campaigns. The son and namesake of the late dictator enjoys rockstar treatment from loyalists in various places he visits. When asked why they will vote for the son, they would normally respond with, “Kasi mas maganda nung panahon ni Marcos (Marcos’ time was better)” even if some studies and statistics show otherwise. 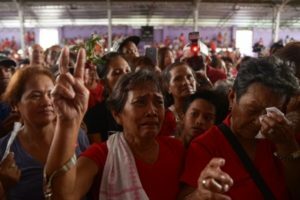 Aside from being loyalists, voters from this age group consists of those who do not necessarily associate Marcos’ administration with human rights violations, political analyst Aries Arugay said. “The older generation has a long memory. They don’t just see the Marcos administration as the martial law period,” Arugay said in a phone interview with Rappler. He said that, to these people, the late strongman represented more than the iron-fist rule but a “strong and reliable” leadership. This is what the young Marcos’ supporters say they see in the candidate, as he tries to mirror the image of his father. For sociologist Jayeel Cornelio, these “old” supporters do not only include loyalists but also those who have been jaded by the post-EDSA administrations. “The people who underwent martial law and People Power, they saw People Power as a turning point for our country. It was almost a religious event, a messianic event,” he told Rappler in an interview. “What is the kind of development we saw after 1986? Of course the poverty was very high. Unemployment was also very high during the martial law but at the same time, the kind of progress people underwent [after EDSA] was not necessarily what they expected,” he explained. 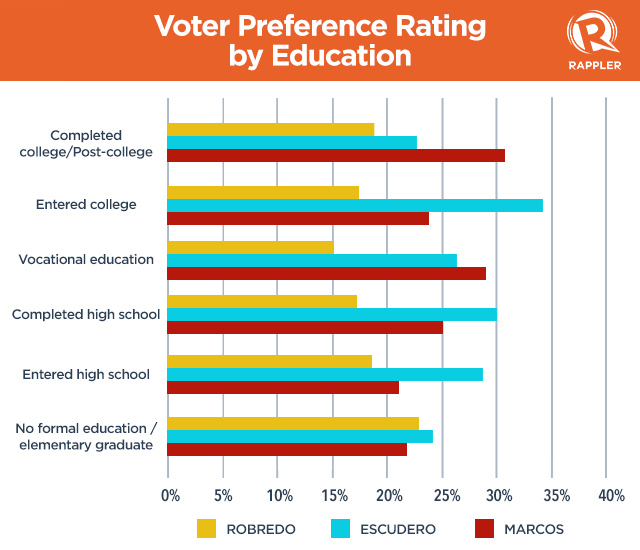 In fact, Marcos is the preferred candidate among classes ABC and those who have completed college education or finished a post-graduate degree. Based on Pulse Asia surveys, he has consistently gotten at least 30% rating from members of the upper classes and the formally educated sector of the voting public. He is ahead Escudero, who only got figures in the line of two’s and Robredo who got less than 20% ratings. Cornelio explained that these “educated” ones are the more disappointed members of the society because they “expected more” radical changes after the 1986 revolution. Arugay, on the other hand, said that these people know that the problem is systemic and the country’s problems cannot be attributed to one candidate or one family. That is why they are unaffected by the negative campaigns against Marcos. For Arugay, anti-Marcos protesters are failing to derail the scion’s vice presidential bid because they keep on strengthening the association of the junior to his father. 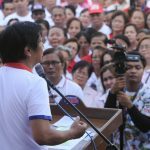 To the loyal Marcos Sr constituency and the others who are yearning for an effective leadership, he said, this strengthens their assumption that if you vote for Marcos, you vote for the return of the leader that, at some point, delivered for the Philippines.